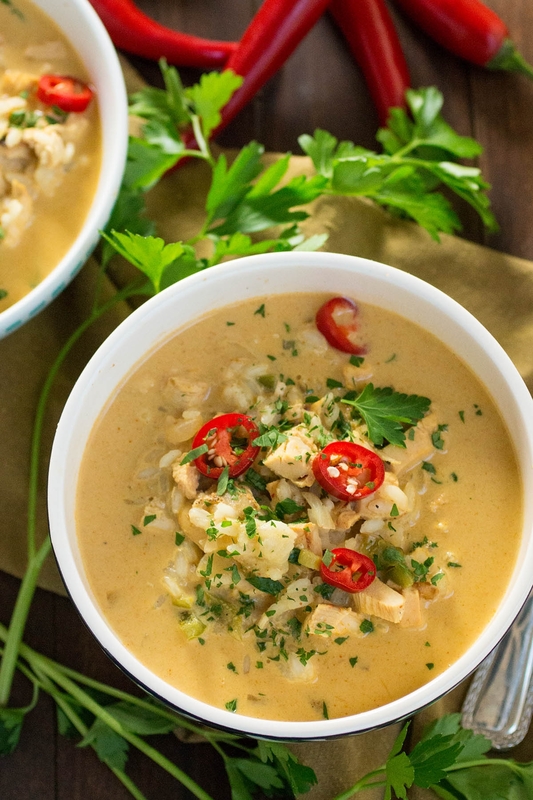 This easy-to-make Thai soup recipe has plenty of spice to warm the bones, and it will fill you up with plenty of chicken, coconut milk, rice and lots of seasoning. I love a good soup. Don’t you? I know it’s winter and some of us in the U.S. are feeling the cold, so a nice bowl of warming soup is definitely welcomed about now, but truly, soup is good any time of year. Particularly a good Thai soup. Thai soups aren’t usually thick and heavy. They’re brothier, typically, filled with all sorts of goodness, tasty morsels floating in your bowl, just waiting to be scooped up with your spoon. 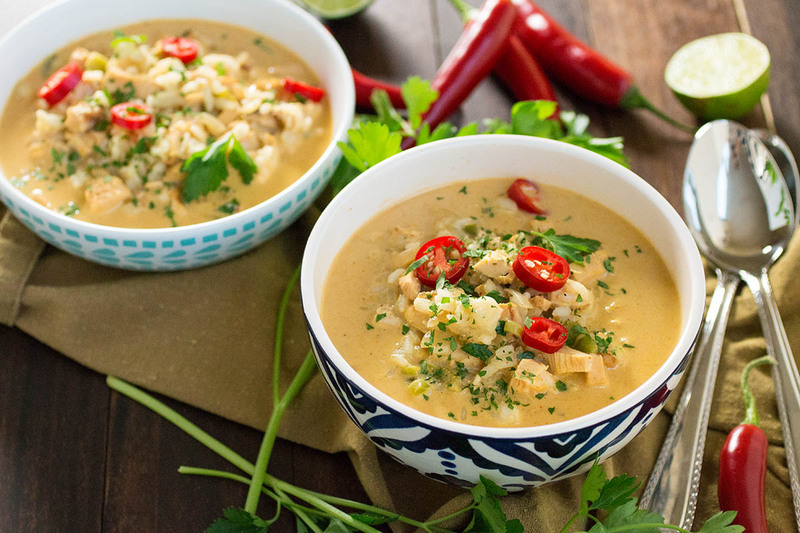 Like this particular soup – Spicy Thai Curry Chicken Soup. Look at this gorgeous, gorgeous soup. Placing the photo here, I want to dive back into it. Too bad I already ate it! I could really go for another bowl right now. 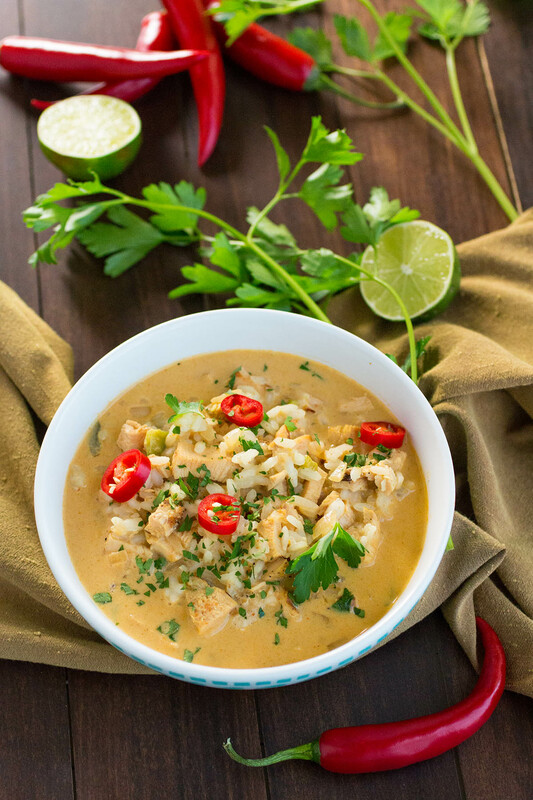 Seriously, there is something magical about the combination of coconut milk, chicken broth and Thai curry paste that comes together in a bowl of soup. It’s a beautiful trinity right there. Add in your spicy chili peppers and blend of seasonings and you transcend! Your taste buds will find themselves in heaven. Want to make some for yourself? So do I! Extra chili peppers for me, please. This particular recipe is quite easy to make. It’s really just a bit of cooking, then more waiting while the soup simmers. It calls for 2 cups of cooked chicken, so leftover chicken would be right at home with this recipe. Of course you can easily use canned cooked chicken which will save you some time in the kitchen, though it doesn’t take long to season and cook up a chicken breast. In a nutshell, you’ll cook up your chopped veggies in a large pan. I use a wok that I received a few Christmases ago. I love the thing. It makes recipes like these super easy, and slow cooks like me LOVE easy. Toss in a few extra chili peppers if you want it EXTRA spicy. I know you want to. 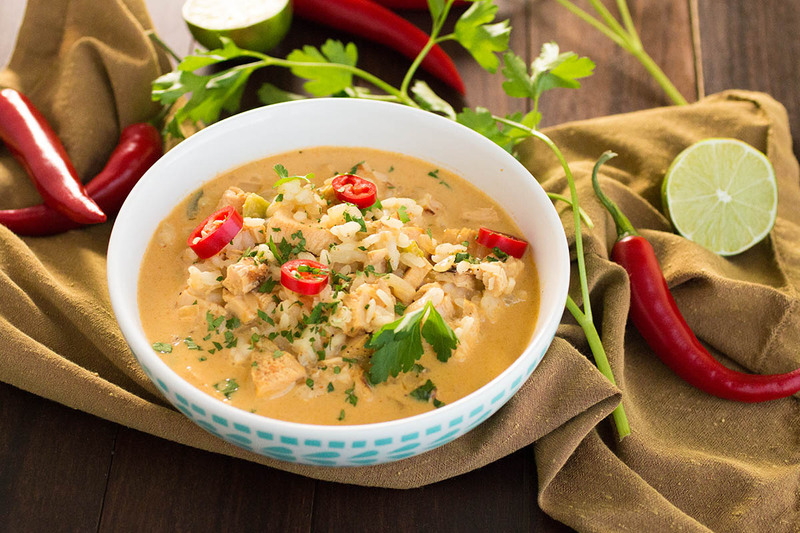 Toss in your chicken, Thai curry paste, and seasonings. You’ll want to cook the chili paste a bit to bring out the flavors. Next, add the coconut milk and chicken broth and simmer the whole thing about 20 minutes or so to let the flavors develop. You can go longer if you’d like, but 20 minutes it totally fine. You’ll get some great flavor at this point. Add in your prepared rice and cook it a bit more, then serve it in bowls. Key step – squeeze a bit of fresh lime juice over the top. It introduces a fresh pop of citrus that brightens the entire bowl. You will thank me for this. You should get 4 filling bowls from this recipe, about 535 calories per bowl. If you’re looking to cut even MORE calories, consider using low fat coconut milk. It will knock each bowl down to about 350 calories each. Not a bad way to start off the new year! I hope you enjoy the soup! Let me know if you make it. I’d love to hear! — Mike H.
Heat a large pan or wok to medium heat. Add olive oil and heat. Add onion, celery and chili peppers. Cook about 6-7 minutes, until they are all softened and begin to brown. Add garlic and cookanother minute. Add chicken, red chile paste, curry, cumin, ginger and cayenne. Stir and cook about 2 minutes to heat through. Add coconut milk, chicken stock and bay leaves. Stir. Heat to a slight boil then reduce heat and simmer 20 minutes. Stir in prepared rice and cook another 5 minutes. Remove bay leaves. Serve into bowls and top with freshly squeezed lime juice and parsley. Can you substitute something for the finger pepper? Kate, cayenne is a good substitute, though you can use serrano as well, or jalapeno peppers for a bit lower heat. Jalapenos are typically easier to find. Let me know how it turns out for you! Am preparing soups to take on our boat for the summer. Can this be frozen? Lee, yes, absolutely. This soup can be frozen. Let me know how it turns out! I made this recipe 2 nights ago. It is awesome and definitely in the rotation! 5 stars. When do you add in the potato? REPLY: Matt, there are no potatoes in this recipe. Perhaps you were referring to the fingerling PEPPERS? — Mike from Chili Pepper Madness. Thanks Mike – sure going to try this. Looks great! What would be a good substitute for the fingerling peppers if the grocery store does not have them? REPLY: John, you can try cayenne peppers, Thai peppers if you can find them, or go with serranos, which are usually easiest to find. — Mike from Chili Pepper Madness.